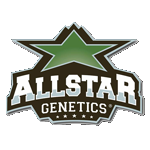 Allstar Genetics are a small, independent group of cannabis enthusiasts who work with medical patients & growers to test the benefits of different genetics. The Allstar Genetics team pride themselves on producing small batches to ensure that only fresh seeds are sold and that the rate of germination is really high. Whilst Allstar Genetics are currently testing and producing dozens of different strains, they only current offer 7, which are all top-shelf quality seeds. You will notice their strains are stocked in all the coffee shops in Amsterdam.